I write to you this evening from the breezy confines of the Common Vision tour bus. Dusk is falling here at our camp-ground on the outskirts of San Diego, with the high crags of the Laguna mountains to the east turning a desert crimson in the sunset. Below the window, just outside, I hear the chattering din of my fellow Tour crew members– they sit beside a forking campfire, headlamps trained upon small white boards in their dirt-caked hands as they sand down the edges, readying them for an orchard-sign painting workshop tomorrow morning. Beyond them, working beneath some towering eucalyptus trees, are two other crew members watering over thirty citrus trees and a half-dozen bags of bare-root fruit trees– peaches, persimmons, figs, apples, plums, and nectarines. Just another evening of Fruit Tree Tour, and as I bite into a piece of citrus as the orange sun finally sets, I begin to set down some recollections for you of my first week on Tour. But before I go much further, perhaps I ought to catch you up some on what this whole “Fruit Tree Tour” thing is in the first place. The Tour is one of the primary activities of an educational non-profit organization called Common Vision. Operating in California, CV is built upon a desire to address a suite of multi-pronged and interconnected problems– poor nutrition in inner-city schools; urban food-deserts (places where community members do not have access to food beyond that which is available in gas stations and convenience stores); and the lack of quality environmental programming in these underserved areas. 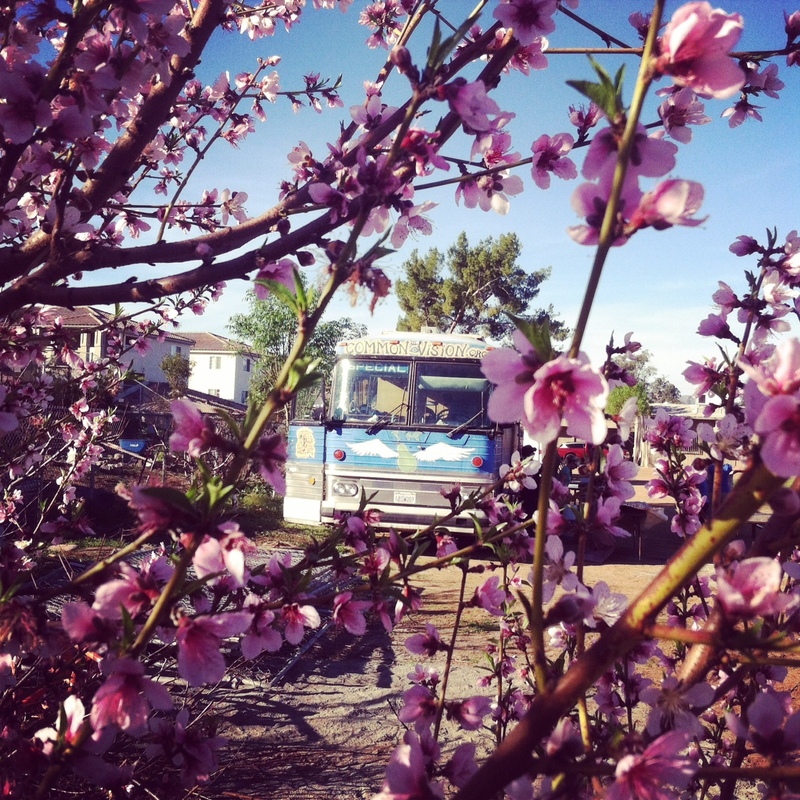 Common Vision believes that one way we might to address these issues is to both simple and profound: plant fruit tree orchards at public schools the length of California, and in the process, to use the opportunity to provide students with unique, immersive, environmentally-educational experiences in the process. Ten years later now, and they’ve done just that– they have planted and now help maintain over 200 orchards from San Diego to Chico, and we’re slated to install another 15 on this tour alone. And that’s where I, the fourteen other volunteer crew members, our two co-directors, and the thousands of school children come in to my tale for you this evening. The “Fruit Tree Tour” tour is hard to pin down into one sentence or articulate as one sound bite. But earlier today, I found myself trying to do just that. I was digging a large hole at Burbank elementary school, huffing and puffing, knee-deep in the cavity, dirt-flying. Two other volunteers were doing the same in holes to my right and left, with our three holes all being excavated right next to the chain link fence that separates the school-yard from the street. The soil was a hard-packed clay, so our shoveling was slow and arduous– but with a little work song and a cool, Pacific breeze riffling through the single palm tree overhead, we were enjoying the process. We knew that within the hour we’d be planting apple and plum trees in these holes with a couple dozen fourth graders, and knowing that our shoveling was readying that experience seemed to make the dirt lighter and the shovel sharper. And there’s the question. 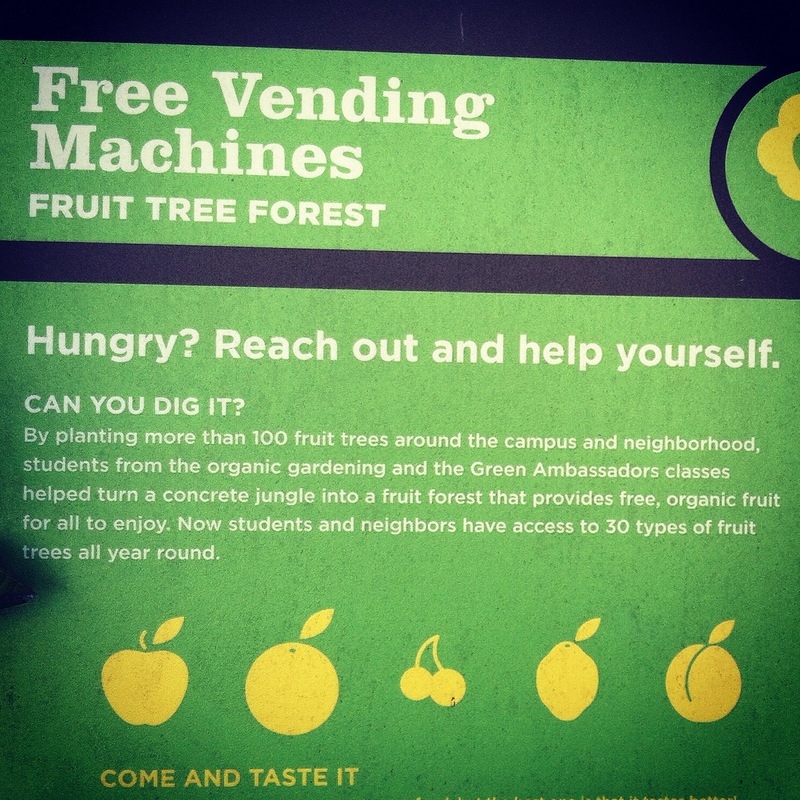 And here’s an answer: “We’re planting fruit trees at schools all over California! We’re about to plant a bunch of fig, apple, and citrus trees here with the fourth-graders, as well as paint orchard signs for each tree, teach them about local food, and encourage them to create positive change in their community.” As I say this, I see his expression go from curiosity, to confusion, to intrigue, and finally to a smile. “Wow, really? I went to this school, and we never did anything like that. Can I come help sometime?” And just then the school-garden coordinator, a sweet woman with the gentle demeanor of a life-long gardener, suddenly chimes in from behind a green-wall of tomatoes in the corner. “Sure! Come on over and I’ll get your information!” and she walked to a door in the fence, unlocked it, and the two began to chat. What was a previously life-less fence, a prohibitive boundary between the street and the school-yard, between the community and the school-kids, had been temporarily dismantled by our presence– and we hadn’t even planted a tree yet. My explanation of Fruit Tour must continue as the kids arrive. Right at ten am sharp, out they come– sixty fourth-graders, with their frolicking gaits and their lively energies. We hear them coming, as the gregarious din that emerges from them grows and amplifies across the sea of pavement like a rising tide. Their teachers steer the flow the best they can, but the kids present a broad swell of excitement that bears down upon the fourteen other volunteers and I. We are standing in front of our massive, colorfully-painted, 1979 MCI MC-8 tour bus, and they seem drawn to us and the bus as irresistibly as waves seek the shore. And just as it seems the wave of little humans will break upon our heads, our co-executive-director/co-hero of Common Vision intercepts them. With quick wit and some lithe linguistic jujitsu, he has them forming a long line along the pavement, facing off from us like two opposing teams– kids versus the volunteer tree-planters. “Good morning!” sheepish at first, all of them eyeing us and the bus, their little eyes dilating in the bright light of their home terrain– a home terrain suddenly populated by these strange new outsiders and the promise of time outside. “We’re so glad you’re here today,” Leo begins, and then proceeds to give a brief explanation of who we are– “We’re from a group called Common Vision, and we drive around Califronia in this sweet, veggie-oil and solar powered tour bus you see behind me, and we plant fruit trees with kids just like you!” And then what work we’ll be doing today– “Some of you are going to be planting fruit trees right here in your school-yard this morning, and then some of you are going to be painting signs to go with those fruit trees. We’ll be planting apples, persimmons, figs, plums, and one of my personal favorites– dragon fruits.” There are some excited gasps and confused “huh?”s at that one. “So here we go, when I give you a number one you’ll be going with my best friend Diana-“ and Diana raises her hand, “If I give you a number three you’ll be going with the great TreeJay,” and TreeJay raises his hand, “If I give you a number two you’ll go with the ‘Bearded Wonder’ Travis–” and Travis raises his hand, and on it goes until six groups are made for tree-planting, and then six more are made for sign-painting. I’m on tree-planting– come on over kids, let’s head to our hole. As mentioned, the hole is pre-dug. The five fourth-graders and I arrive at it to find one large pile of the soil that was excavated in the digging process, and next to that a smaller mound of rich, fragrant, dark-hued compost. The hole is surrounded by what was previously impenetrable shrubbery– an aromatic rosemary and something else I don’t recognize– and our work helps more land become available, providing some more earth acreage upon which the children can tread and play. With the inert sea of pavement that surrounds most urban schools, there are rarely open-patches of land for kids to interact with the dirt, plants, flowers and trees of their home. By digging up under-utilized slices of school-grounds like this one, and inserting into them these wild-leaning fruit-trees, we are inviting non-paved Nature back into areas that have traditionally had no use for it/Her. But unlike a mere “greening” of the campus, wherein some landscapers come in to pepper the grounds with a few more flower features, we are here to help the kids themselves beautify their place. And to do so, and to guide them into the experience, I present them this– a three-foot tall, gaunt, bare-root peach tree. Teehee. I hold the tree up, say it’s name, pass it once around. The five kids take it in their hands one by one, some inspecting it closely, some running their hands through the roots like fingers through hair, and one boy holds it daintily with just two fingers, concerned that it’s getting his hand dirty. It returns to me and I place it down on the earth beside me and lower myself into a crouch, facing this little circle of little people. Next I ask us all to introduce ourselves by saying our name and our favorite fruit. I also have them draw their first initial in the soft dirt in front of them, both to help me recall their names and so that they may begin to bring their sensing bodies into the experience. Introductions completed (amidst the sounds of similar scenes going on within the five other tree-groups to my right and left), I start guiding us in. “Doing what?” one girl asks. I proceed to ask them to consider that most food comes from farms that are quite far away, and during every step of the way, fuel is burned and carbon is added to the atmosphere. This sets up ideas around the importance of local food (and you can’t get more local than growing it at home or at school), the issue of green-houses gases and climate change (burning fossil-fuels in increasing the amount of carbon in the atmosphere, which is in turning trapping more heat on earth and changing our climate) and then also nutritional values of fresh fruit. I don’t go too deep on climate change, mostly because I’m not sure they are ready to start confronting the emotional weight of the problem– namely, that the world around them, run by the adults they rely upon to keep them fed and safe, is also a world of deeply complex, daunting problems. Problems that will, inevitably, come down on them. “Right! And we’re breathing out carbon-dioxide. Now, what do you think a tree does when it breathes?” and I proceed to teach/remind them that trees and plants are constantly doing the opposite, breathing in our carbon-dioxide and breathing out the oxygen we need. I ask them to imagine these fluid, bright blue arrows streaming into their lungs as they inhale, and woody-brown arrows wafting out of their mouths as they exhale. And then we watch the tree as it inhales those exhalations, pushes them through its bark-clad body, and then exhales those pulsing, shimmering blue gases of oxygen back our way. With our arms, we push out breaths and and pull in the next, acting this out. Five fourth-graders and a thirty-two year old man, on a sunny morning, performing some sort of silly thai chi– a practice that is helping us recall our constant participation with the breathing plant beings of the world. A quickie but an easy get. “Why else are we planting fruit trees?” I ask again. “Si! It was a baby once!” one boy manages through some giggles. “Just like us!” says another girl, adding her own giggles to the growing gaggle of them. “And will future humans get sit under the shade of this tree we plant?” I inquire. “Yeah, they will. I don’t know about you all, but I think that’s just amazing, and I’m really glad you’re all doing this today– making better air, fruit, and shade for other people in your community. Fast-forward twenty years. Spring-time in California, 2035. Over two-hundred school orchards that were planted between 2006 and 2015 are in full bloom– seen from above, the black-top pavements of the school-yards all pocked with the micro-bursts of colorful flowers abuzz with bees, careening through wavering rich greens of the thousands leaves, forming mini-forest canopies. Seen from within, the trees’ well-pruned and cared-for branches all sturdy and strong, laden with early fleshy fruit and home to myriad birds and bees. Seen from below, the once-thin trunks and graft-unions now robust and muscular, the ground that was once compacted dirt and grass now rich in humus and mulch. Seen from within the soil, the once meager roots now thick and well-established– well-interlocked with mycorrhizal and fully-supported by the micro-biology that booms in the billions. And seen from the play-ground, kids that were born in 2028 come careening out of class like bees from the hive. They run to swing-sets, to ball-fields, maybe to hover boards, and maybe into these orchards. Like the honey bees noisily at work in the flowers above them, crawling deep into the floral structures and drinking deeply of the nectar, the kids climb around and through the trees, playing games and reading the fruit-varietal names of their trees. They recall the fruit they ate from them last fall, the sugary-contentment they felt as they ate the food they helped grow. They recall the workshops that Common Vision, or some program like it, did with them earlier in the spring to care for the trees, fertilizing and weeding and pruning and making new signs, affirming their role and their relationship to these living, food-providing, shade-creating, oxygen-generating and carbon-sequestering organisms. So we begin pawing into the soil with our ten hands, back-filling the hole to ready it to receive the tree– letting our hands get dirty, our heads to become engaged, and our hearts to perhaps become a little more rooted into the toil and soil of this warming and whirling world. @fiddleheadmama helping Fern learn more about her home bio-region. While of course we’re proud Vermonters now, we also plan to raise her as a member of this larger watershed community of the Lake Champlain Basin. Our lives are, in many ways, more intertwined with the people of NY and Quebec with whom we share this basin than we are with those on the eastern edge of Vermont (the Connecticut River watershed) or the southern (Hudson River watershed.) • Another guiding ethos that this map helps with: for the majority of our time when we’re not traveling to see other watersheds around the world, there’s this: “Stay local, go deep.” -Barry Lopez. • But how? Dunno, but we’re sure as heck going to try.